After mulling over our options, we decided to hire a 4x4 and driver and explore northern Sichuan rather than fly somewhere else in China. 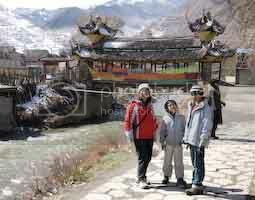 Domestic tourism is massive in China. With growing wealth, the Chinese must be travelling more and more so all the standard tourist sites are very busy even in low season. I would hate to see these places in high season. By getting our own wheels, we hoped to get away from standard tour routes and see the countryside. Our driver and guide was a friendly Tibetan fellow by the name of Gonpo. It was great to get his perspective on the Tibet issue and hear about his life and ambitions. It was Gonpo that made our trip most special. We drove out to Wollong National Reserve and saw the giant panda's there. We had already seen pandas in Chengdu but at Wollong, you can join as volunteer staff and help look after the pandas. Now this wasn't as exciting as it first sounded. Basically, we got to clean out their enclosures. We didn't even get to feed them. 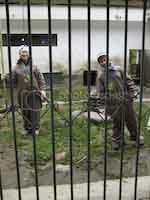 But it was still interesting to get a glimpse of life as a panda keeper. To volunteer to clean up panda poop, it costs 250 yuan each. If you want to play with a teenage panda, it costs 1000 yuan. If you want to play with a baby panda, it costs 5000 yuan! The Wollong Hotel was unheated and it was very cold. Even the restaurant didn't have heat. You have to eat fast before all the oil in the dishes congeals. Each room had a rattling electric heater to wheeze out some warmth. However, the beds had electric blankets and thick comforters. It's the first time I've ever slept under an electric blanket. Fabulous! I think I'm going to buy one for chilly UK winters. We then drove up to Songpan in about six hours enjoying the gradual demise of industrial landscapes in favour of rural valleys full of apple tree's coming into blossom and people tending their vegetable plots. Vegetables are grown anywhere there is a patch of dirt. Tibetan villages cropped up more and more. As we got to Songpan, spring disappeared and we landed in winter. It was cold. No one seems to be able to afford heating. Everyone gathers around coal-fired stoves in shops or the occasional electric heater. Luckily we knew we were in for cold weather and had been buying assorted warm clothes. The next day we enjoyed a Western breakfast at Emma's Kitchen and spent the morning walking around Songpan. It was much less touristy than all the other places we've been. It's not very large but well worth a few hours stroll. In the afternoon, we slowly made our way to Jiuzhaigou stopping for pictures along the way. 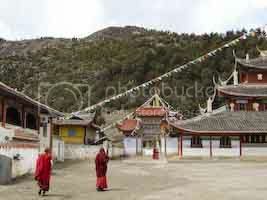 This included stopping at a Tibetan monastery and having a good look around. 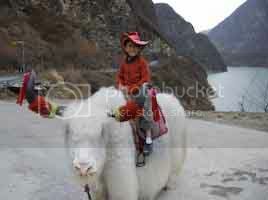 Yaks, goats, and horses are all road hazards along the way. It was a more picturesque and rural China that we had hoped to see. We got stopped by police for the third time on our way there. 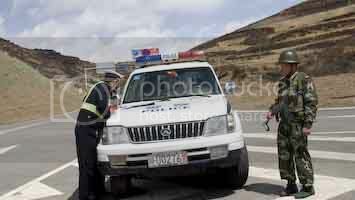 Gonpo displays a picture of a Tibetan Lama and a prayer book on his dashboard so with the ongoing Tibetan troubles, he gets targeted at any checkpoint. After our stays at unheated hotels, we splurged on the more upmarket Kangba Noble Manor taking a double bedroom suite. While the lobby and halls are unheated as usual, the room was warm and it had an excellent hot shower! Recommended. 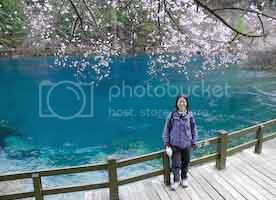 We spent the following day with the herds of Chinese tourists hiking in the Jiuzhaigou scenic park. 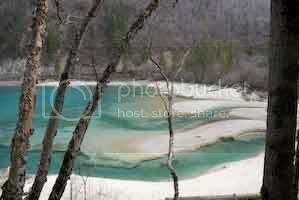 It's a series of azure lakes and tumbling streams in a mountain valley. It's pretty but nothing exceptional in April (Autumn would be fantastic). The kids had a great time playing in the snow at the top of the valley. For millions of nature starved Chinese visitors, it must be heavenly. Hiking is a bit of a misnomer. You take a bus between the sites and walk along wooden or stone pathways. You're not allowed off the path. In China, nature needs to be protected from the hordes of tourists. We covered the park in a day since there's a hefty fee for both the park entrance and the bus. 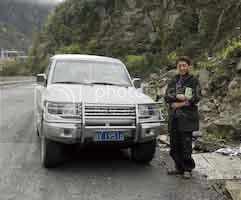 We left the next day and tried to go to Huanglong, another scenic park, featuring a calcified terrace of water pools. 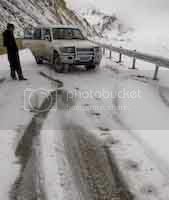 However, we had to cross a mountain pass at 4000m that was covered in snow. 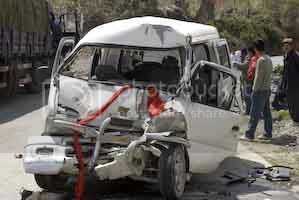 Our 4x4 went into a low speed spin and hit the barrier in front of a very steep precipace. It made a few bad dents in the 4x4 but it didn't stop us moving on. We crawled carefully to the top of the mountain pass and after looking at the road down the other side, decided to play it safe and return to Songpan. The government had closed off access to any towns to the west and snow prevented access to any other places we could visit near Songpan. We heard that police were even preventing buses from bring tourists to Songpan and the town felt half closed. We decided to end the trip a day early and drove back to Chengdu in 7.5 hours. The kids are taking these long drives really well. Driving is manic in China and we saw the sad results of one accident. Cars weave all over the road in any lane and near misses are common. I held my breathe on many occasions!